My local authority to ‘save’ money have given the Social Care budget by contract to Hestia and in the process they are trying to cut my care budget by almost 50% without any explanation or even notification! The first I heard of it was when someone from Hestia came to see me about how my ‘indicative’ budget could be spent & managed! And I am not an isolated case. Local Authority’s, strapped for cash by central govt cuts, are playing budgets & politics with disabled people’s lives by cutting their care & support services! 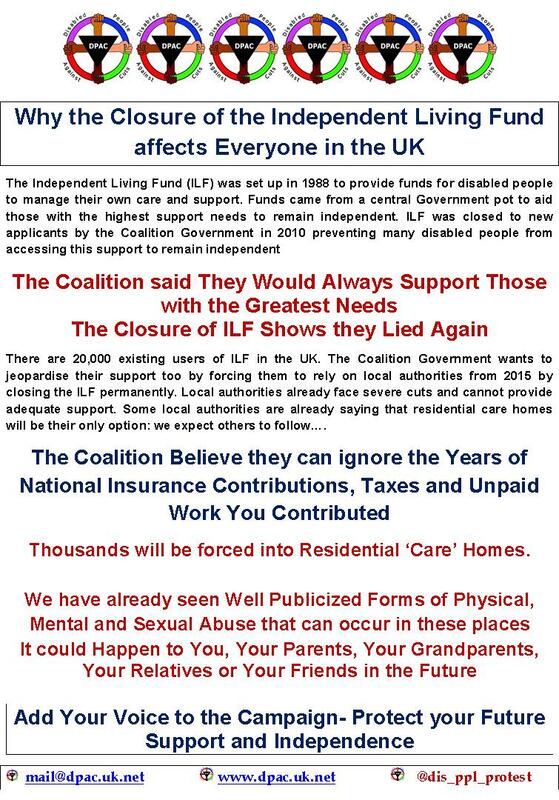 If & when the ILF is scrapped in 2015 & local authorities take over the individual budgets there will be nothing stopping them doing the same to the ILF funding we currently receive – those of us who were lucky enough to be assessed for it before our heartless and mendacious, lying government closed it to all new applicants in 2010! A Senior Social Worker I spoke to said “When the ILF closes in 2015….” I asked her how she can say ‘when it closes’ when its fate is still in supposedly under consultation and she said “Oh, my mistake thank you for correcting me.” It seems its fate is sealed as is ours in their eyes! It’s verrrrry worrying! Very alarming! Very frightening! this should not be allowed, it must be against human rights to be forced to live in residential care ? carer’s get no way the amount local residential care would cost , this is just another way to feed the rich who own these residential homes, CAMERONS BUDDIES NO DOUBT !!! Absolutely disgusting. People who receive ILF funding are the most severely disabled in our society. why should they pay for all the mistakes made by people who are supposed to know what they are doing. The government encouraged people to live independently, and its made such a positive difference to their lives, now these same people are having their independence taken away. Dave King: Down with the Paralympics! Down with Channel-4-liberalism! Universal Credit – how is this simplification?